A historic day in American soccer lies ahead today with the possibility that long-standing TV viewing records for the sport in the USA will tumble. When the USA play Ghana today at 2.30pm Eastern Time on a Saturday afternoon (7.30m in the UK and 8.30pm is South Africa), and with the country whipped up into a Donovan-led frenzy, the ratings look certain to challenge the previous record for the most-watched soccer match in America. The record is currently 18m, the number of people who watched the US Women’s 1999 World Cup win over China, followed by the 14.5m viewers in the USA for the 1994 Italy v Brazil World Cup final, and then the 13.7m viewers for USA v Brazil in the round of 16 in 1994. Significantly, in ratings terms, all those games were held on US soil. The big numbers already achieved for some matches in South Africa are therefore extraordinary. Predictions abound as to how many will tune in today. Some 13m watched the England game two weeks ago on ABC, with another 3.8m watching on Spanish-language Univision (for a total of 16.8m). Then 6.1m tuned in on a workday Wednesday morning (plus 2.2m more on Univision) to see Donovan’s injury-time winner against Algeria, making that the most watched weekday broadcast in ESPN’s history. Interestingly another 1.1m people watched the game live on the internet on ESPN3, making it the largest US audience ever for a sports event on the web, and another 650,000 people watched while riding the train or bus on their mobile phones, a sign of the changing times for sports viewing platforms. It should surprise nobody if the ABC audience alone for today’s game exceeds 18m. Certainly Donovan’s last-gasp goal the other day is drawing interest from writers, media and fans that would not know offside from off-Broadway, but these are people that soccer long since wrote off as being essential to the games growth in the USA. They are nice to have for ratings, but soccer is not banking on them for the future. The real story of the ratings and interest is the number of fans that are now soccer-savvy, and fully appreciative and knowledgeable about the global game. Soccer in the States today bear little or no resemblance to 1994 or indeed 1999 when the 18m record was set. 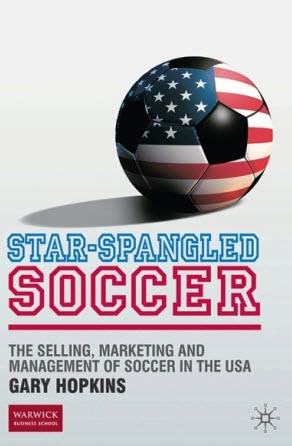 Then it was primarily “bandwagon” effect, today it’s a soccer-educated audience. They know and appreciate quality soccer and will engage and consume it when presented with it. The MLS is not then the bellwether of soccer popularity. The World Cup is the true bellwether of it growing importance in America, and today’s numbers will be a loud shout to that effect, when released in the coming days. In 1990 just 713,000 tuned in for USA versus Italy. Today’s figures will be massive because today’s soccer on TV is about “quality” and “experience”. The World Cup represents both. The games are of great quality, by definition, while the TV experience from ABC and ESPN is exceptional. It’s a different Soccer America in 2010. Teenagers and young Americans love soccer, it’s a cool sport, while being a “soccer fan” is also cool. The thousands of young Americans flooding the stadiums in South Africa emphasise the point along, with the hundreds of thousands pouring into bars across America. Hispanic America, soon to be 25 per cent of the USA’s population, loves soccer, as do many other ethnically diverse Americans. ESPN and ABC are screaming from rooftops to anyone that will listen that the World Cup is the biggest of biggest deals in sports. America is finally listening. And the world should listen too.